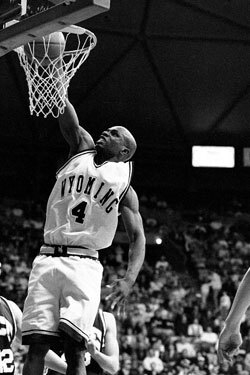 Ugo Udezue dunks the ball during a 1999 game against Rice University. Alumnus Ugo Udezue leads Africa’s Continental Basketball League into the future. The Arena-Auditorium crowd chants “Uuugo!, Uuugo!” It’s the 1998–99 season, and sophomore Ugo Udezue averaged 20.5 points and 7.5 rebounds, helping lead Cowboys basketball to the first round of the National Invitation Tournament. Udezue, a native of Lagos, played for the Nigerian junior national team in 1996, receiving a scholarship that same year to attend Riverdale Baptist School in Maryland. In 1997, the 6-foot-9 center was recruited by University of Wyoming. He graduated in 2001 with his degree in communications with an emphasis on public relations and advertising. While injuries kept him from an extended professional career, Udezue became a successful agent for BDA Sports Management, with clients including international basketball players Andre Roberson, Nenê and Festus Ezeli. But Udezue had an even bigger dream: to create an African basketball league modeled after the U.S. National Basketball Association. In 2017, he did just that, putting his efforts into the Continental Basketball League. “My dream to start a basketball league morphed from a desire to give back through my experiences—and understanding that we can create something special and similar in a space that didn’t exist before we got there— to add a private equity-driven sports and entertainment platform that can generate revenue for years to come,” he says. As an agent, he saw many African players coming to the United States who were not developed. Originally, he invested in the Lagos Islanders team in 2015 but wanted to do more for the basketball system in Africa. Udezue moved back to Lagos full time in the fall of 2016 to pursue his dream of creating a strong African league that not only develops African players but also has African team owners and employees. Modeled after the NBA, the Continental Basketball League games are complete with cheerleaders, music and entertainment. Udezue says his education at UW helped prepare him to make these dreams a reality: “My PR class with Cindy Price shaped my marketing and PR vision.